It seems that lately I have been finding a lot of great book resources. This one is a real gem. I wish it had been around years ago when Pookie was first diagnosed. 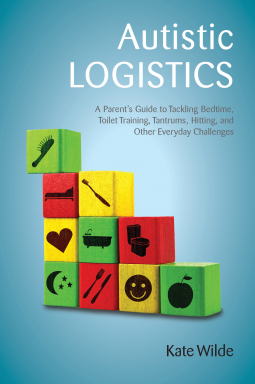 Autistic Logistics is a new book set to be released in January, 2015. If there were ever a book that should be made available when a parent gets the autism diagnosis, this is it. The author is a Director of the Son-Rise Program. The ideas she presents in this book are based upon the Son-Rise methods. As the parent of an autistic child, I can attest to the difficulty parents can have in teaching the basics of self-care to these precious children. Developmental skills, such as toilet training, can be a very difficult thing to help your child accomplish. Self-regulating their emotions to curb meltdowns and tantrums is another tough lesson to help the children learn. This book gives solid advice and examples of how to tackle the most basic of issues that parents of autistic children face. Based on decades of experience, Kate Wilde tackles these day-to-day issues and more, using tried-and-tested techniques to help you transform the challenges of home life and create harmony. The unique approach featured in the book, which encourages you to support your child’s need for control rather than fight against it, can have transformative results. Not only will you learn to see through your child’s eyes and help your child in a way that honors his/her specialness, but you will also begin to free yourself from the pressure and discomfort that can so often accompany everyday challenges. As I read through the book, I thought of just how timely it was for it to come to my notice at this time. Our own child is reaching that age when toilet training is being addressed. Using this one area as an example, let me say that this book has the most useful and detailed information that I have ever read. Ms. Wilde starts off by taking a look at poplar attitudes towards toilet training that are actually making the process harder. She then breaks down the reasons why some accepted methods do not work very well. One case in point being to place the child on the toilet every 30 or 60 minutes. The problem with that is you often have a child soil or wet their diaper in between trips to the toilet. This can become a frustration to both parent and child. What she suggests is something that just makes sense. Keeping a diary of the times your child eats, drinks, and soils/wets their diapers. Start noting the time intervals and once you see a pattern, you can get the child to sit on the toilet prior to when they would normally go in their diapers. She goes further into the exact process, but it is a very good method to try out. It makes far more sense to me. Most people have a set routine, a body time clock. For some, they always have to go to the toilet 30 minutes after a meal. Going on that theory, if your child has a routine, you can get them to the toilet before that set time arrives. This greatly increases their chances for success in the toileting. There are many other areas of development which are addressed in the book. Each are ones that we face often as parents of autistic children. While the child’s therapists can offer advice, the parents really need solid guidance at home as well. This is where the book comes in. The clear presentation of ideas is done in such a way that it is easy to implement in the home. I strongly recommend this book to anyone who is a parent or caregiver of a person with autism. It is a book that I wish had been around when our son was first diagnosed.